This post is just what I needed to get back on track today! Thank you so much, Marc! Nothing but the truth in this post. Seriously, it’s awesome. #7 is so freakin’ awesome! Love love love it!! Thank you for putting this advice out there. Hats off to you guys ..
his post reminds me of some decisions I need to make in my life, and some actions I need to take. This is perfect for me today!! – I have spent two days stressing about which direction to move in for my new business and this was spot on! Thank you so much – I get something from each and everyone of your posts – always! This came at the time when I really arrive at a crossroad. Thanks for giving me the courage to choose which direction to turn. Definitely needed to hear these today. Just what I needed to hear right when I needed to hear it. Thank you! I’m going to print these out and carry them with me. I need to remember all of these in my life. Thank you for this and everything else that you guys do. Thanks for such a great post. All apply. This is great!! Especially the post #7, until I read this post this made me think that, I’m running through somewhat same situation… Thanks a lot!! I’m happy that I’ve subscribe to this blog.. It’s life changing, and very inspiring..
Great list and so true! It is a very wonderful essay to read especially in these days. Sometimes you need to have something to push you pursuing through life, with strong faith that you can change. Marc and Angel, This Post Is One Of Your Best,But #7 Really Is So True, So True Thank You So Much For SHARING. As and addict lover of your write-ups I always read in between the lines ‘cos there’s something that always inspires me- No 6 brings back some memory of my messy breakup wt my ex. BW Marc n Angel, other articles you’ve written have been my strength for the past 1 yr plus since I first stumbled on this blog, thank u! This post could not be more appropriate for my life today. This is definitely one I will share in my blog and will keep to reread. Thank you for posting such great material! I remember Wayne Dyer telling a story of a parking lot gate operator running out in front of moving cars that were by-passing the toll gate. The guy was so invested in “being right” that he risked his life to prove his point. It’s so very limited in our growth and adventure to be so stuck in our single belief – defending our position. Thanks for another wonderful post. 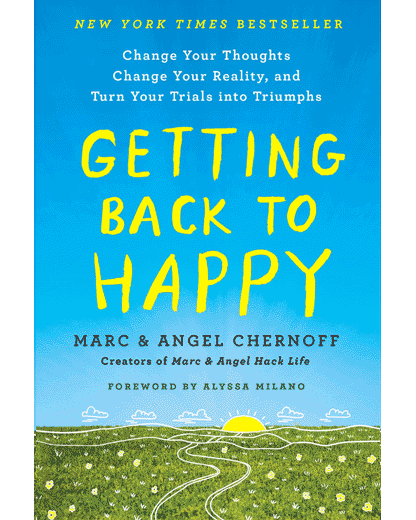 Marc and Angel, you two are such positive forces in our world. You are both wise beyond your years. I have recommended your site to everyone I know and I hope you never go away. Thanks, again! Number 5 is the main one for me to conquer!! Just what I needed to read as a motivational speaker and author. I love this site, it is so rich.. I absolutely enjoy all the the great content that you guys put out! Without fail each & every day I’m hoping that I receive a new email from your Marc & Angel site. It’s always such a great blog to read before my feet hit the floor and I get my day started. Love this! great points here. Thank you for posting these uplifting words, it helps me and i apply it in my life. The past is gone, its buried, the future we don’t know yet. The present moment is all we can count on, why not focus on being happy and saying uplifting words to others. I remember someone told me monica you are number one. focus on you, and take negative comments as a grain of salt. Kudos to you Marc for listing these things here. Isnt it true that all the things that we need to give up to move forward are things that are within us. These are our attitudes, opinions, world-view, perspective, philosophy of life if you may say so. The change has to come from inside-out. To move further in the right direction, we need the change from within which can propel us forward. This is one of my favorite quotes. I try and live by it. And this post reminded me of it. Definitely one of the best lists I’ve seen in a long while. Thanks. Your lists reframe my perspective all the time. Thank you! I’ve often noticed that I get bogged down by my judgments and assumptions about other people and their intentions, and it’s just not worth it. Good tips. As always with lists such as these, I become aware of the things I need to work on. Great blog, Marc and Angel! I’m going to add NEGATIVE SELF TALK to your list. All too often we believe the negative thoughts that swirl through our minds. Learning how to change, eliminate, or release these thoughts can help people move themselves to action MUCH FASTER. Well put. The power of now, as Eckhart Tolle’s book is titled, is really the power that will drive our lives. So much of worry is living in the past or future. Cut out worry, and suddenly life blooms before you. Plan, but don’t worry. Planning requires decision-making, worry is circular mind chatter. The power of now is what I remind myself whenever I get overwhelmed or when I start leaving tasks unfinished because of all the things I want to do. Point #1, “Letting the opinions of others control your life,” is a major killer spirit. If you live, breathe, and seek approval from others, you’re not really living. By the way…What’s not discussed is how your family can control and manipulate you with their opinions. There isn’t enough information on ‘how to’ stand in your power when it comes to family because we’re taught that ‘blood’ ties are the be all and end all. This isn’t true. Have the courage to let go of the opinions your family has about you. If you lose contact with them, so be it. You can make your own family by choosing to surround yourself with people who love, respect and support you, no matter what. Thank you for the words of wisdom. I finally figured out what is “holding me back”. These reminders nailed it! #7 is something I’ve been thinking about lately pretty much all put into one….. amazing, really! Great post! I always look forward to these inspirational (but not too preachy!) lists. #3, #4, and #5 are right up my ally when it comes to wanting to change my job situation. I know I’m unhappy with it, but I’m extremely INDECISIVE about what I want to do next. I’m a huge PROCRASTINATOR too! And I know I need to CHOOSE to change things for myself to live the life I want! (career-wise, since everything else I’m very content with and grateful for in my life). I’m printing this out and maybe hiding snippets of it around my cubicle tomorrow! The essence and wisdom in all your messages are not possible without the inspiration from God. You both are blessed. Inculcating these wisdom that brings growth from within is what prayer is all about. I allot more time reading your messages than for prayer. It has helped me grow. I’ve read quite a few of your posts and lists over the last six months and they have asked me some very thought provoking questions. You have also helped to lift me up when the world has been dragging me down. So it is a big thank you from me to both of you. Keep on inspiring people I/we need all the help we can get. It is just a shame some times we don’t ask or we don’t listen. I swear, in the first 3 points, you just described me. And this post is so right about everything. Thanks so much. Spectacular. So incredibly inspirational. Exactly what I needed. Thank you both so much. Nice. I’m gonna share this with my brother. I know he’ll like it. I love this site, it always lifts me up when I feel down, thanks for making me think outside the box, and also for making me see the positives far outweigh the negatives.